The Amme Talks was published as part of Triple Canopy’s Immaterial Literature project area, which receives support from the Andy Warhol Foundation for the Visual Arts, the Brown Foundation, Inc., of Houston, the Lambent Foundation Fund of Tides Foundation, the National Endowment for the Arts, the New York City Department of Cultural Affairs in partnership with the City Council, and the New York State Council on the Arts. The Amme Talks is a conversation between poet and machine. In 2003, poet Ulf Stolterfoht and a chatbot named Amme (which means “wet nurse” in German) met in Berlin. For one week, Stolterfoht interrogated Amme: not just a chatbot, actually, but a steel-and-glass construction with a computer interface, which is connected to a glass of milk, a robotic arm that tips over the glass, and a tube that releases water, as if urinating. 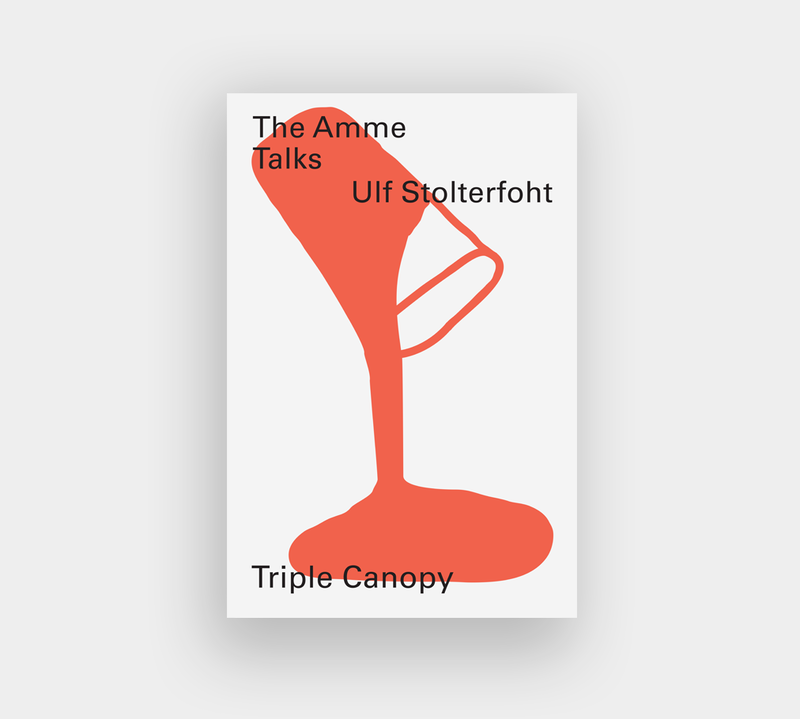 Stolterfoht asked Amme—the creation of artist Peter Dittmer—about the nature of authorship and the agency of language; he intended to turn the answers into an essay on poetics. While Amme replied to every question, Stolterfoht observed that the output was “highly self-reflexive, if not entirely self-referential,” and impossible for him to assimilate into his writing. He’d hoped to glean something from Amme’s performance of an idiosyncratic and mechanical form of human speech. Instead, he stumbled on a remarkable “second-order realism” in which words refer not to things but to themselves. In the dialogue presented in this book, Stolterfoht glimpses something other than what we understand as poetry, something apart from “solipsistic exercises” with language, something like “endlessly liberated speech”—a potential revolution in poetry mounted by a milk-spilling chatbot.